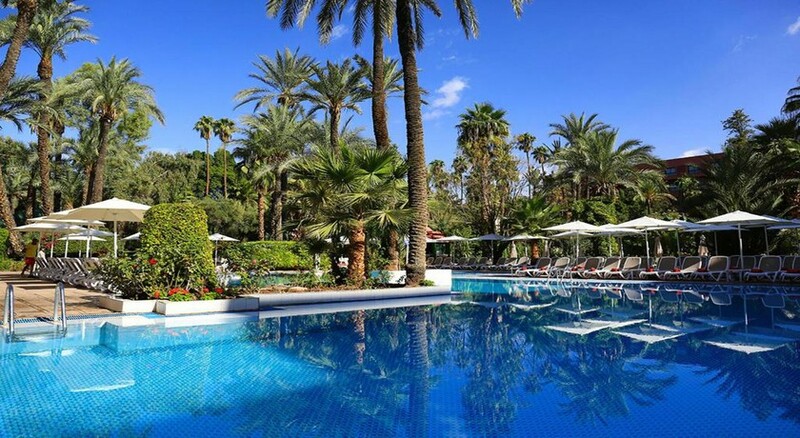 Set amid a 3-hectares’ private park featuring luxury North-African designed gardens and mature palm trees in the heart of Marrakech, the Kenzi Farah Hotel is a perfect holiday destination for families and couples. Located in the cosmopolitan district of L.Hivernage, this 5-star resort is boasts spectacular facilities including an outdoor and indoor pool, hairdressing and beauty centre, fitness centre, boutiques, children’s playground and a variety of cultural excursions on offer. The Kenzi Farah Hotel Morocco boasts 380 elegant rooms surrounded by palm groves, with 10 suites spread over four buildings and four floors. If that’s not enough, the Kenzi Farah Hotel Morocco features its popular O Spa, dedicated to wellness and beauty with a list of rejuvenating treatments on offer, from massages to scrub therapy and traditional Henna masks. Discover the beauty of Kenzi Farah on your next spectacular city break. 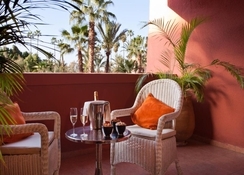 The Kenzi Farah Hotel enjoys a central location in Marrakech. The Marrakech Menara Airport is located approximately 4km away from the hotel. The scenic museums and gardens are within 3km from the hotel and the famous 12th century Koutoubia Mosque is only 2km away – a historic highlight. There are many restaurants near the hotel at a walkable distance, where you can find Moroccan, European, French and Mediterranean cuisine. The Menara shopping mall is only 3 minutes’ drive away, too. The Kenzi Farah Hotel features 380 well-furnished, air-conditioned rooms that include 10 suites spread over four buildings on four floors. All of the rooms are large and feature double-glazing. The elegant rooms are divided into categories, including Superior Rooms, Deluxe Rooms, Family Room, Junior Suite and Royal Suite. All of the necessary, modern amenities and bathroom facilities are available in all the rooms including LCD satellite TV, WiFi, 60 rooms with either terrace or veranda, air conditioning, hairdryer, bathroom, safe etc. 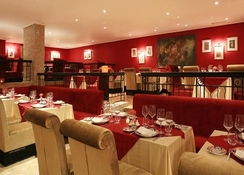 The Kenzi Farah Hotel of Marrakech provides a melting pot of culinary arts and diverse pleasures for guests. There are two quality restaurants on-site, Mediterros Restaurant and The Orangery Restaurant, plus two bars offering breakfast, lunch and dinner to the guests. 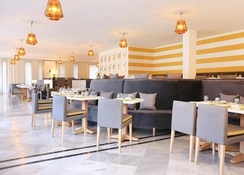 The Mediterros Restaurant invites diners to indulge in Mediterranean cuisine, presenting healthy dishes full of flavour and colour, while the Orangery Restaurant offers a comfortable family setting with a multitude of culinary choices. The Pool Bar offers refreshing breakfast, drinks and snacks at the poolside. 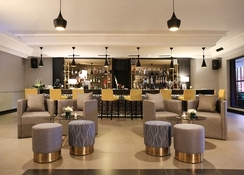 And there is a Lobby Bar that is open throughout the day and night where you can enjoy a chilled-out drink. You can use the various fitness facilities in the hotel including a clay tennis court, French ball, bowling pitch, table tennis, and beach-volley ball. There is also an aqua gym, which is open in the morning and in addition to this hotel provides belly dancing lessons and Zumba to its guests. There is a mini club in the outdoor location where different types of games are available for children as well as parents, and for sporty guests a golf session package is provided, too. A local tax is payable at the hotel and ranges from £1 - £3 per night. 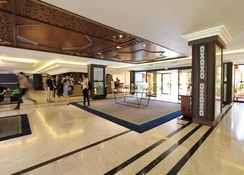 The hotel was very nice and staff were very friendly especially towards children. Room was nice and clean. The hotel was in a perfect location about 5 mins from the mall and about 20mins walk to the main market. We often walked cheaper than getting a taxi. There was a variety of food everyday and they even booked in entertainment on one if the nights definitely recommend it. Overall a pleasant hotel. Stayed for a week with my three teen age children. Firstly hotel cannot be classified as a 5*, more of a 3*. Originally had issues with the room allocated, facilities in the room were extremely mediocre. After much debate and two nights the room was changed but not as I requested originally ie: interconnecting or two bed suite, rooms were at opposite ends of the corridor, inconvenient when traveling as a family with kids. Food variety was very limited and service very slow and unattentive, however the Moroccan restaurant food quality was outstanding but again lacking on service. I suffer from terminal illness and due to my treatment am limited to my time in the sun and tire easily, hence am unable to always make to the restaurants, this was explained prior to booking and in room service was requested. However upon arrival the restaurant staff was extremely rude and insulting in their behaviour but the issue was resolved after management became involved but the incident did cloud the holiday and cause unnecessary stress for what was supposed to be a stress free break with the family. Overall the location of the hotel is the best. The area outstanding and we were within walking distance to all the main attractions and the neighbourhood was extremely safe and convenient. The last two days of our stay were enjoyable as we got to know the staff and a few members were exceptional in their assistance and overall attitude. I would stay in the hotel again, purely for its location but highly recommend a change in customer service attitude, cleanliness and variety of cuisine in the main buffet restaurant.